Buyers in Hyderabad who were sitting on the side-lines, waiting for signs of a concrete revival before committing to new investments, have shown renewed interest in the housing market. Improved political and infrastructure landscapes can be credited for this revival. While average weighted prices in the city did not witness any change since January 2016, 65 percent of the localities posted a capital growth in housing prices in Apr-Jun 2016 as compared to the last quarter. West Hyderabad saw property prices going north by three percent due to maximum number of new project launches in all ticket sizes. Housing belts such as Chandanagar, Pragati Nagar, Narsingi and Madinaguda countersigned healthy demand on the back of affordability and the prospering IT/ITeS sector. 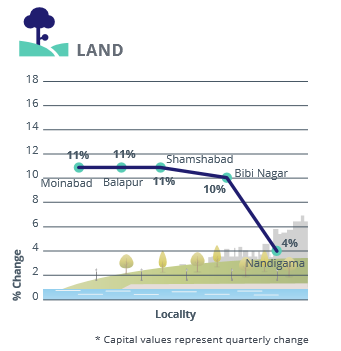 With land parcels in Shamshabad, Adibatla and Mokila becoming increasingly exorbitant, investors have explored new regions such as Moinabad, Balapur and Nandigama with an ‘ask’ price as low as Rs 200 per sq ft. There was a consequent capital growth of 4-11 percent Q-o-Q in these localities. The state government’s recent proposal to carve new districts in Telangana have propelled growth in areas close to Ranga Reddy district. As the work on the 22 km stretch of the 158-km Nehru Outer Ring Road (ORR) stands completed and is expected to be open to the public soon, investment parcels in land in and around Ghatkesar and Medchal have risen. These pockets witnessed average ‘ask’ prices of residential plots going up by around 10 percent Q-o-Q. Witnessing an average increase of six percent in the year 2015-16, the rental market of Hyderabad is flourishing. Over 75 percent of the localities have registered a rise in rental values in the last one year. 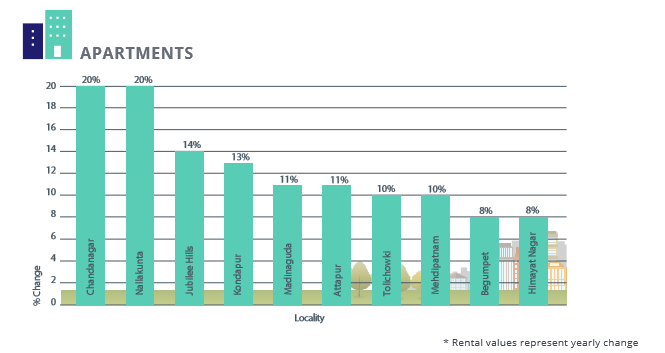 Hyderabad recorded the most profitable rental market in the last one year (Apr-Jun 2016 against Apr-Jun 2015) in comparison to all other metro cities, including Delhi NCR, Mumbai, and Bangalore. The improving commercial market is one of the major drivers for demand of rental stock. National and multi-national companies such as Apple, Salesforce and Micromax, among others, are increasingly investing in the city. Such robust office space absorption is spelling good news for the housing sector of the city. 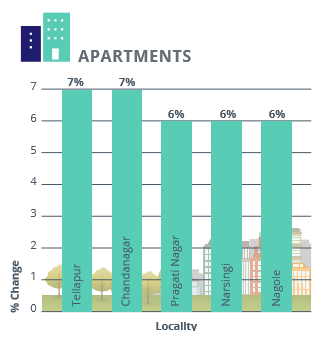 Localities close to popular commercial centres in the city such as Chandanagar, Kondapur, Madinaguda, Madhapur Nizampet and Manikonda have witnessed a rise of 5-20 percent in average rental values Y-o-Y. Established localities such as Attapur, Tolichowki, Begumpet, Himayat Nagar and Nallakunta, too, have seen a rise in rental values. Easy availability of water and a self-sufficient social and physical infrastructure are the main drivers of consistent rental demand in these popular localities. Severe water crisis has led to a fall in the rental values of the otherwise popular Appa Junction. Tenants are unwilling to move to the locality as the overall cost of living is very high in absence of regular water supply. Additionally, the water pipeline connection from the Godavari River is yet to reach the area. Average rental asks, thus, have dipped here by 8 percent Y-o-Y. 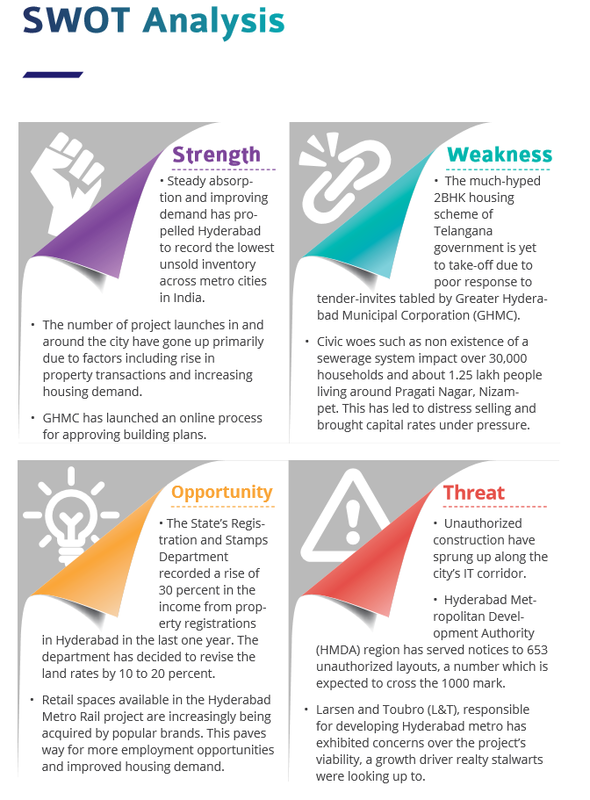 Even as the real estate market of Hyderabad is strengthening, the risk appetite of home buyers is still feeble and hence, the demand for ready-to-move-in properties continues to be significantly high in the city. Residential apartments continued to be the most demanded property type in Apr-Jun 2016 followed by residential houses/villas. The city witnessed nearly 25 percent of the demand for residential land, while the demand for builder floor units was the lowest. There was, however, a significant mismatch in the demand and supply of residential houses/ villas. While the demand was strong at 34 percent, supply was close to 20 percent. 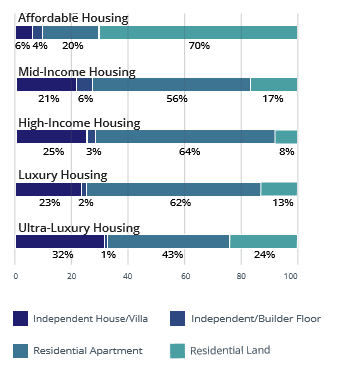 This indicates developers’ focus on building apartments despite the popularity of independent dwellings. Homebuyers in Hyderabad continued favouring affordable properties. Over 60 percent of the demand in the city was for properties priced within Rs 40 lakh. Supply of such properties was close to 50 percent. The majority of the new launches taking place are in the said budget range, as well. The gap between demand and supply in the mid-income housing category continued to be high. While the demand for properties within the said budget was almost 35 per cent, its supply was nearly 20 per cent in the current quarter. Developers have halted the construction of luxury properties to a large extent, as they are finding it difficult to get buyers for their existing stock. Hence, the supply of luxury properties continue to surpass demand. The demand for such properties was mere five percent with its supply over 15 percent. Demand and supply remained stable across all configurations in the first half of 2016. There was, however, a noticeable mismatch between the demand and supply of 2BHK and 3BHK units. While the 2BHK units were under-supplied, 3BHK units remained overstocked in the city. Over 40 percent of the 2BHK units were available in the budget of Rs 25-40 lakh, majority of which are ready-to-move-in. 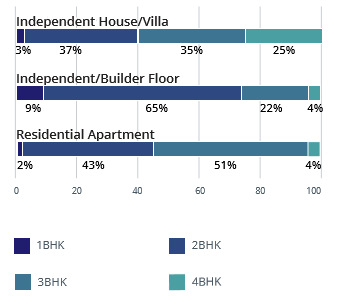 Developers in the city continued to construct 3BHK units, primarily due to healthy profit margins. However, over the years, 3BHK has gone out of reach of the denizens and they have started preferring smaller units. Majority of the supply of 3BHK units in Apr-Jun 2016 was in the range of Rs 60 lakh-Rs 1 crore. The 1BHK units, like in most of the other metros barring Mumbai, continued to be the least demanded and supplied property unit in Hyderabad. Those available, are majorly within the budget of Rs 25 lakh and are ready-to-move-in. 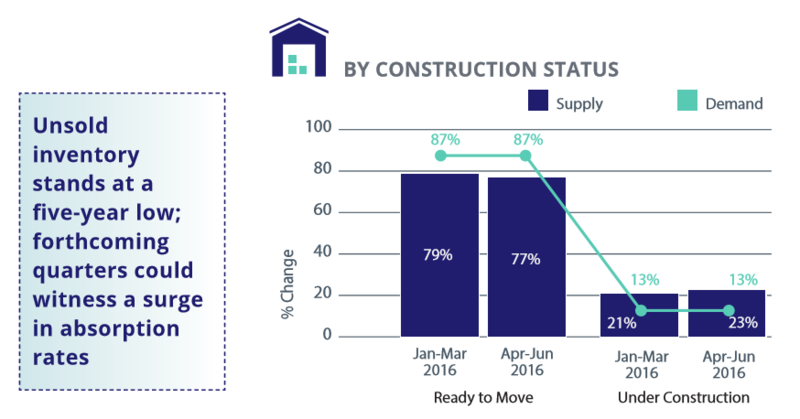 Demand for both, ready-to-move-in and under-construction properties remained more or less stable in Apr-Jun 2016, against the previous quarter. 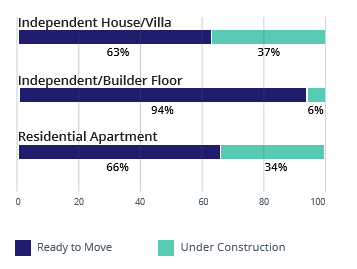 Home buyers in the city are unwilling to take the risk of investing in under-construction properties and hence, nearly 90 percent of the demand in the city was recorded for ready-to-move-in housing units. Nearly 60 per cent of the ready-to-move-in properties were priced within Rs 40 lakh, while under construction properties were primarily concentrated in the Rs 40 lakh - Rs 1 crore budget range. Under-construction properties continued to be over supplied in the city. There was a mere 13 per cent demand as against the supply of 23 percent. 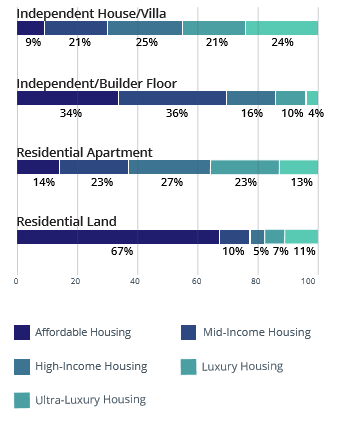 The majority of these under construction properties are available in the western quadrant of the city. Localities such as Manikonda, Kondapur, Chandanagar and Gachibowli house a heavy supply of such properties.